Crankies do not have to be backlit, but it increases the drama factor if you are able to perform in a darkened room. The amount of light you need depends on the thickness of the scroll. A thin, translucent parchment paper needs less light than two thicknesses of felt. If the light is too strong for the scroll, you will get a "hot spot" in the middle of the screen. Not enough light, and images will be hard to see. You might need to experiment with different bulbs. 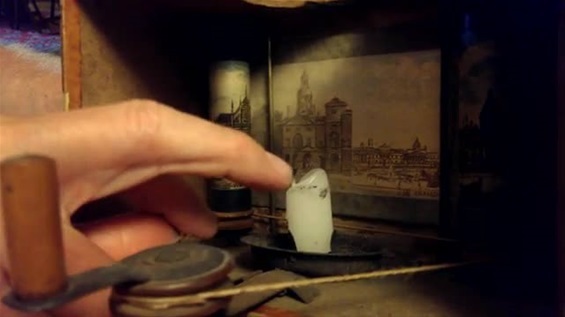 In the 19th century, miniature moving panoramas were illuminated with a candle. This moving panorama is from the collection of Erkki Huhtamo. 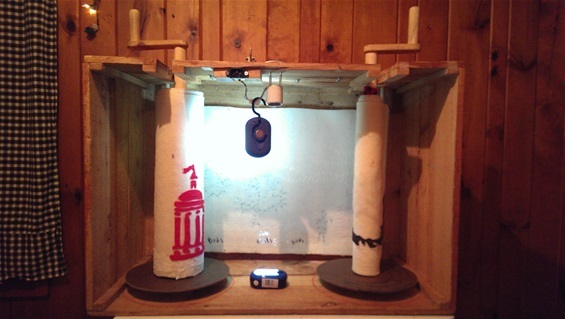 The box is cardboard and the paper scroll was made from translucent paper so that the light could shine through. It's no wonder that few of these survived! Using candles is still an option, I know Anna and Elizabeth back lit their Lost Gander crankie with candles and it's beyond beautiful. 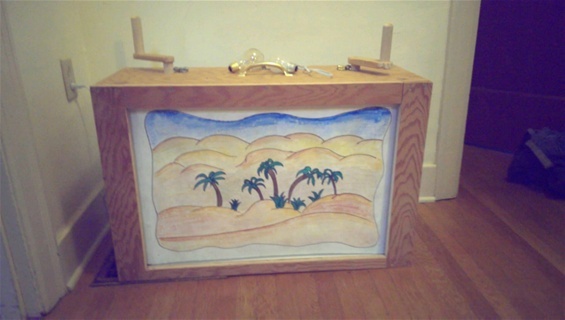 This is Dejah Leger's crankie box and it was made by her father-in-law Louis Leger. 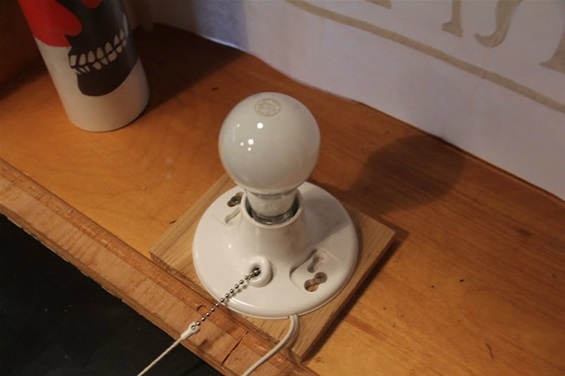 Louis installed a light fixture on the bottom of the box with a pull chain. 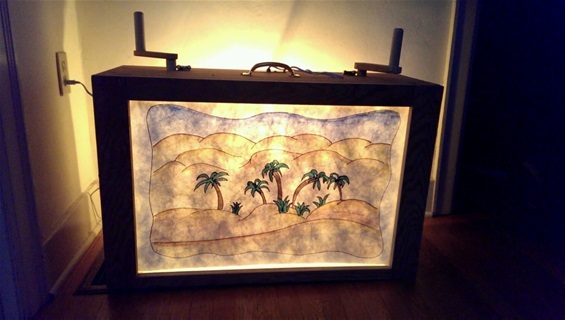 The light fixture could also be on the "ceiling" of the box. Dejah uses a small, 15 watt light bulb. Depending on the light fixture you buy, it might require some wiring. This is Katherine Fahey's crankie box. 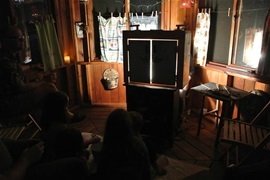 That's Katherine at the crank and a friend behind the box with a shadow puppet. She is using a clamp light. This is an inexpensive and easy option and it clamps easily to the top of the box Clamp lights are readily available at hardware stores. This is a battery operated Energizer LED camping light. It provided plenty of light to shine through two layers of felt. No chord - yeah! 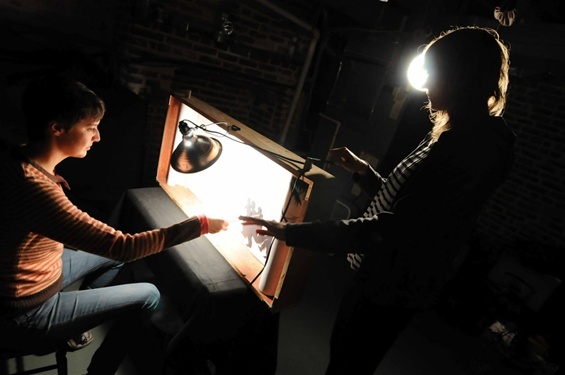 But it is a bit big and can get in the way of shadow puppetry. Here we have two battery operated LED flashlights. Inexpensive and easy to find at the hardware store or drug store. 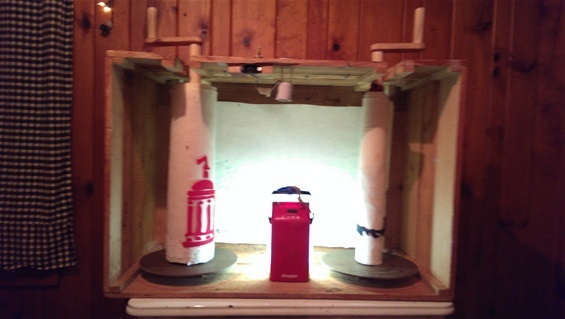 One flashlight didn't provide enough light to fill up the box and shine through the felt so I tried using two; one sitting on the bottom of the box and one hanging from the top. It still wasn't enough light but this option might work well if you have a thin scroll, made out of lightweight paper or parchment paper. No chord. However, I discovered that two light sources created a double shadow effect with the shadow puppetry which was not what I was aiming for. 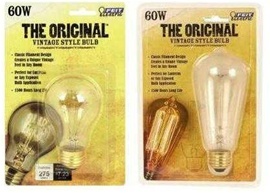 The latest thing I have tried is using a filament light bulb. I found these at Home Depot. They give off a soft, amber light that gives a sepia tone kind of look. This is a crankie by Greg Johnson, watercolor on Tyvek. 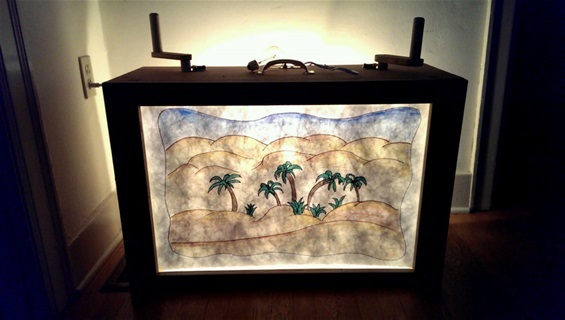 Here it is lit with a vintage stlye or Edison filament light bulb. Here it is lit with a 25 watt, "regular" light bulb. And here is no back lighting.